The origin of Dutch Belted or Lakenvelder cattle is not known but they have existed as a pure breed since the sixteen hundreds. At this early period they were found principally in the ownership of the nobility in Holland. The name Lakenvelder or Lakenfield cattle derives from the word “laken” meaning a sheet or cloth, referring to the white band passing around the body. In some countries animals with this marking are known as “sheeted” cattle. This belt or sheet is of pure white hair extending from the shoulders to the hip bones and should encircle the body completely. 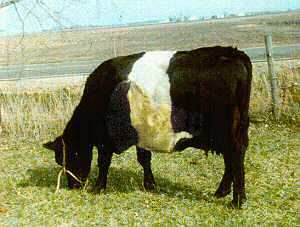 The cattle are otherwise black (or occasionally red). In their original form they were horned and primarily a dairy breed – comparing favourably with the Holstein in milk yield. 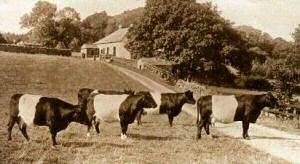 By the 1930s Lakenvelder numbers were very low in the Netherlands and the Herd Book was closed. In the 1970s a Trust was set up to save them from extinction in their own country. However, the breed had been exported to the USA as early as 1838 and spread to both Canada and Mexico; it still has good support throughout North America. It can be found in New Zealand but only in very low numbers.